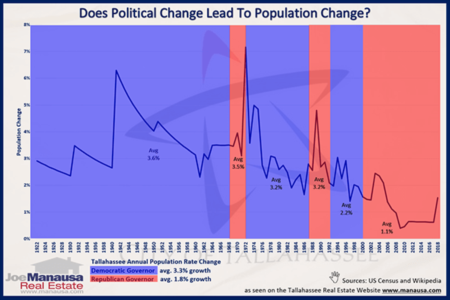 There are so many variables that impact the activity in the Tallahassee real estate market, and Tallahassee population changes might be the most significant over the long haul. When we build too many houses and throw the balance between supply and demand out of kilter, population growth over time increases demand and allows the market to return to equilibrium. With this in mind, we can look to long term population growth trends to forecast future housing market changes, and today's graph makes it clear where home sales should be heading. 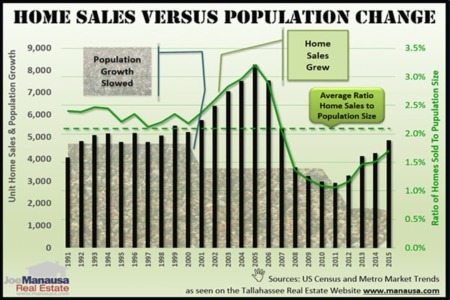 According to the US Census, Tallahassee's population has been growing at a very consistent rate. The real estate graph below demonstrates this clearly. The number of people living in Leon County, Florida is shown at 1/10th scale by the shaded area, while the black vertical bars measure the number of home sales recorded in Leon County each year. The ratio between home sales and population is shown as a solid green line and is measured on the right vertical axis. Finally, the average ratio recorded in the 1990's (roughly 2.3%) is extended through the end of last year as a dashed green line. What this means is that on average, in the 1990s, Leon County recorded a number of home sales each year that was equivalent to 2.3% of the size of the population. If we look at how the solid green line and the dashed green line relate in the 1990s, we can see that there was not much deviation between the two. But the next decade brought us the boom of the housing market (shown as "A" or expansion in the graph). And like all good things, a correction ("B" in the graph) was in order to bring things to normal. A regression to the mean analysis of the graph seems to show that the correction has been greater than the expansion. Unfortunately, we do not know if the 2.3% average from the 1990s really represents "normal" for Tallahassee, as we would need to see this measured over a much longer period of time. If the long-term average ratio between homes sold and population size were adjusted to be 2.0%, then we would expect a longer correction period. So we do not consider what we see in the real estate graph above to be an absolute understanding of home sales versus population size, but it is a start and it does make me believe that the number of home sales will continue to rise for quite some time. This is merely one measurement among hundreds that we maintain at Joe Manausa Real Estate in order to have a better understanding of the Tallahassee real estate market. 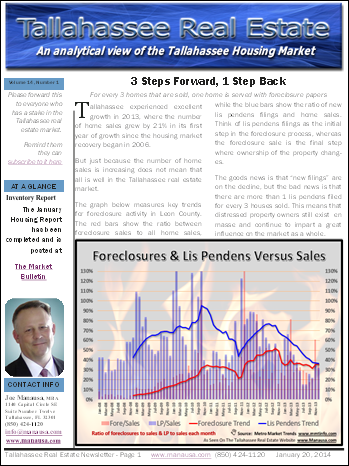 You can take advantage of our work and keep current on conditions in Tallahassee by subscribing to our real estate newsletter (download the most recent edition by clicking the image above right). 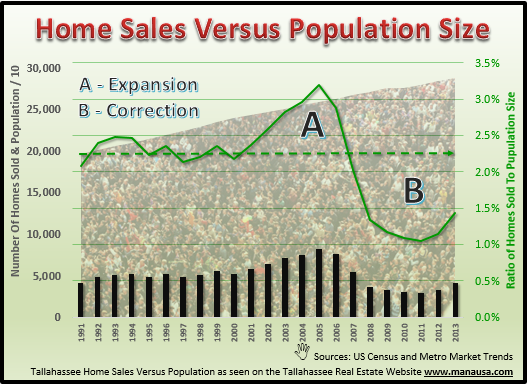 Tallahassee population is not the only variable that will impact home sales in 2014 and the years to come, but it is one that makes me optimistic for growth again this year.